By Josephine Gallagher | May 7, 2013. Unsuitable accommodation and anti-social behaviour is making home a hell for the longest remaining resident of St Teresa’s Gardens. Margaret O’Toole is living in “horrendous” conditions and is still waiting to be offered suitable housing by Dublin City Council (DCC). Margaret has lived in the complex all her life – making her the longest residing resident at 61 years. However, after years of de-tenanting of over 200 families from the blocks, she is still appealing to DCC for a house. Last month she appeared on an RTÉ documentary called ‘Room Wanted’, discussing the issues of many people waiting on council housing lists. “It’s just stupid that they are pulling down the flats and just leaving us here. She’s here 61 years and I’m here 19 years”, said Sinead O’Toole, Margaret’s granddaughter. The O’Tooles feel this is becoming increasingly unsuitable accommodation for the grandmother due to her health issues and the continuous anti-social issues around the area. According to the family they have encountered problems with youths throwing stones at their windows from time to time and sometimes they can’t leave their home due to gangs gathering on the stairs. “Sometimes there are gangs on the stairs and you can’t even go down. It’s mostly during the weekends,” said Sinead O’Toole. Due to the fact that many residents have already been re-housed from above, below and on either side of the O’Tooles, they find it very difficult to heat their house. This makes their gas bills more expensive at the end of the month. “It’s like an ice box and we spend more money on gas than anything else,” said Sinead O’Toole. Críona Ní Dhalaigh, the local Sinn Féin councillor, has said an application has gone into the Department of Environment for funding for around 50 new units. However, they are still waiting on confirmation that the money will be made available. The councillor believes that the dereliction is “part and parcel” of the anti-social behaviour and that “it just doesn’t help”. 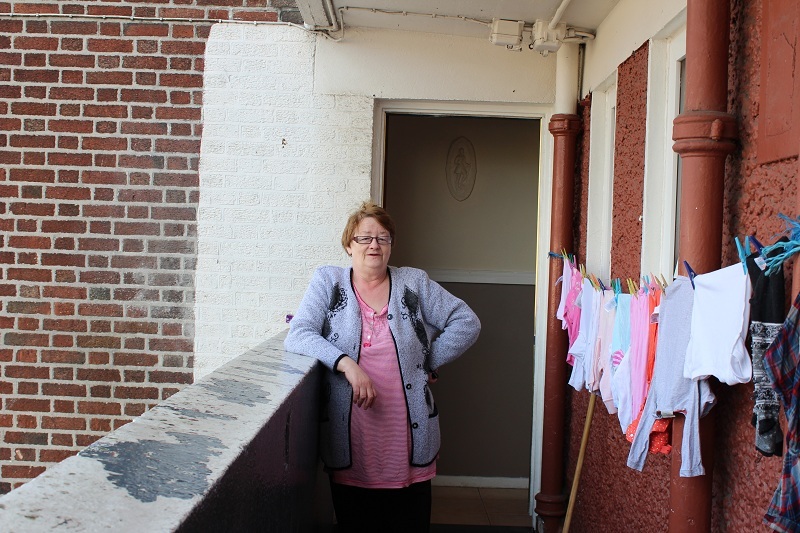 “The conditions are horrendous and it’s causing a lot of mental anguish for those that are feeling isolated on balconies on their own. This needs to be moved on, there’s an urgency with this,” said Críona Ní Dhalaigh. According to Ruairí McGinley, the Fine Gael Dublin South councillor, good progress has been made in de-tenanting those from the left-side block. He stated that plans are in place to refurbish those same blocks and to move the residents from the right side over. “They have contractors ready to go; they are just finalising the design work, so the probability is that in June they’ll be able to start work on that,” said Ruairí McGinley.